"Scott Wolf bridges two musical worlds. 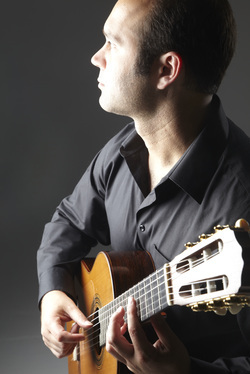 He plays the classical guitar with a calm mastery and unique sensitivity that touches the heart; as a flamenco guitarist, he plays with perfect 'compás' and a true Andalucían depth of passion." Listen to Scott's latest release Lullaby here or on iTunes and many more, you can purchase a physical copy here or by clicking the cart icon in the player. This album of lullabies, for the classical guitar, was made to celebrate the birth of my son in August of 2015. It includes a few of my favorite works from the classical guitar repertoire, arrangements of songs that my mother and father hummed or sang to me as a child, and some beautiful works I discovered while researching this album. It is my hope that listening to these recordings leaves you with the same feeling they give me, a sense of warmth, comfort, and tranquility.